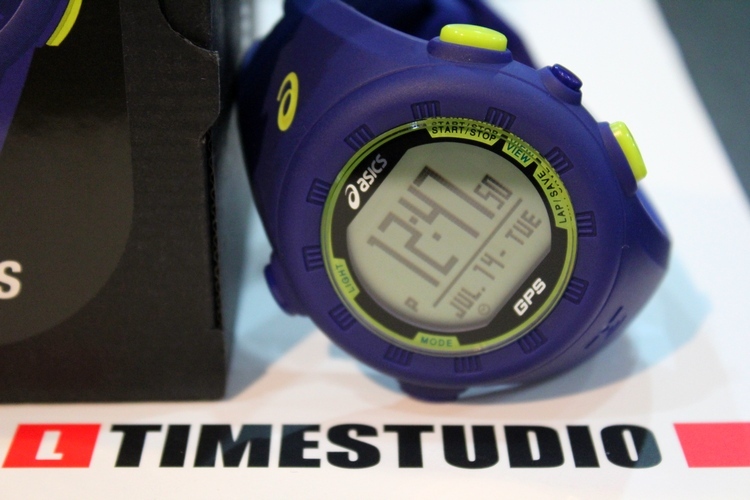 We have our own individual running essentials, the things that we cannot run without. For me, aside from the de rigueur running outfit and shoes (barefoot runners are exempted), they are sunglasses, visor, lip gloss and race belt. Save for some quick speed intervals that go for less than an hour, I do all of my long slow distance (lsd) trainings not without a single of these items. Not even the lip gloss! I have plenty of race belts in rotation depending on whether I needed something with large storage capacity or something to match the color of my running outfit. Mostly I use the former during my aquathlon days (Tuesdays and Fridays) when I needed to carry not only my pool entrance money, keys and mobile phone but also my goggles and swim cap. However, the problem I encounter with this belt is that, even though it can carry all of these items, they are all stacked in its expandable pouch located in front. This concentrated weight makes it juggle as I run eventually causing the belt to loosen up and juggle more, definitely not a welcomed distraction during a run. 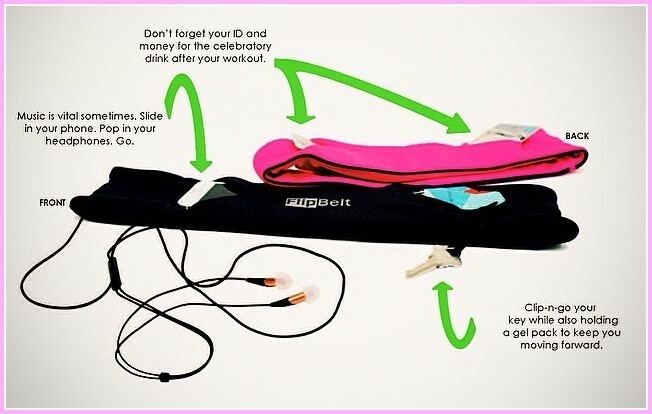 A friend introduced me to flipbelt, an ingenuously designed sash-like running belt that is un-running belt like! 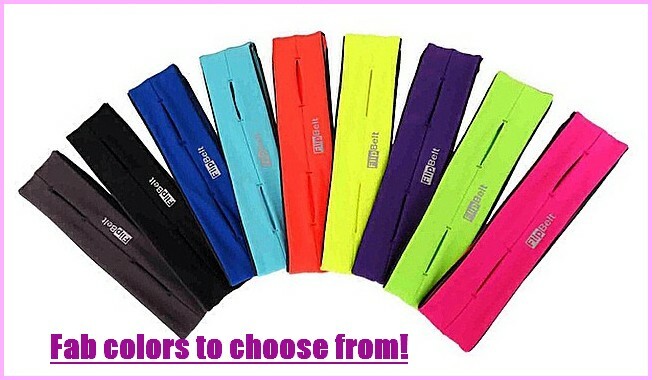 First or all, it comes in a fabulous array of colors to choose from like pink, purple, yellow and even your staple black. Next, when worn, it looks like a part of your running outfit and not like a dorky race belt – garter, zipper, elastic cords, plastic locks, and all! In fact, it resembles more like a wide colorful band either at the hem of your tech shirt or singlet or at the top of your shorts, skorts or compression tights, simply fabulous! 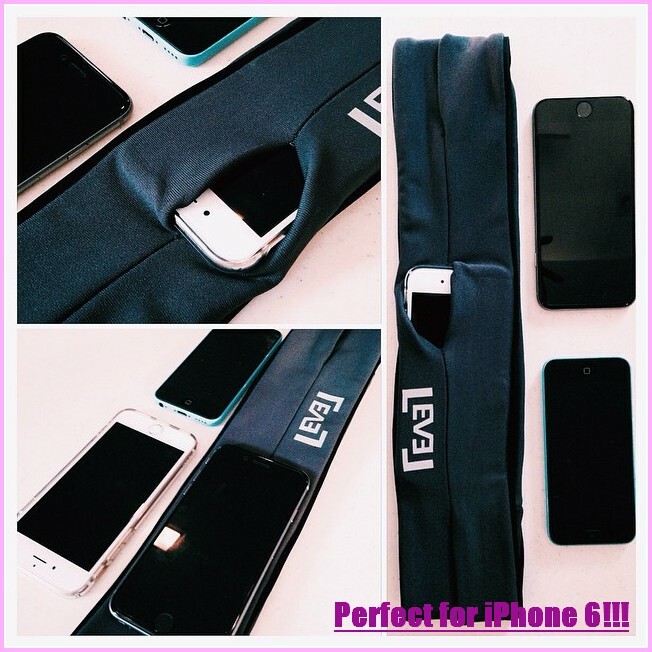 It has slits all over, a total of four (two in front and two at the back) where you can insert needed things during the run or any physical exercise for that matter. The essentials for me would be my phone, keys, plastic pouch containing some money and lip-gloss (but of course!). All of my race belts can accommodate this bare minimum without any problem. 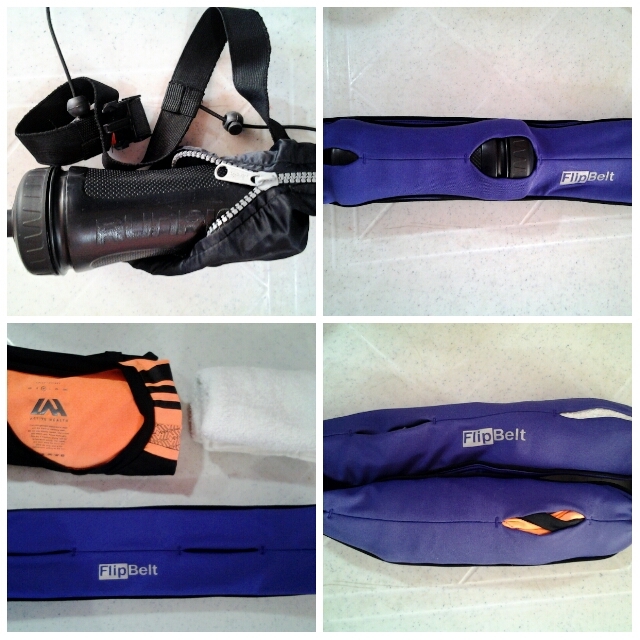 However, only my black one with expandable pouch mentioned earlier can accommodate my swimming gears. Then I tried placing all these in the flipbelt. Well, let us just say I fitted them all quite easily with more space, in fact lots of space, to put in an item or two more depending on size. In this instance, I threw in a whole banana of considerable size! Unlike in my regular trusty belt, these items were distributed throughout my waist not only in front but at the back as well. This placement made them just an item deep all around and not stacked in a limited space. For example, since I will be using the goggles and swim cap much later after I ran, I situated them at the back while the keys, the money pouch, and the phone went in front. Indeed looks can deceive. I bet you would not guess that an item this beautiful could be that purposeful! 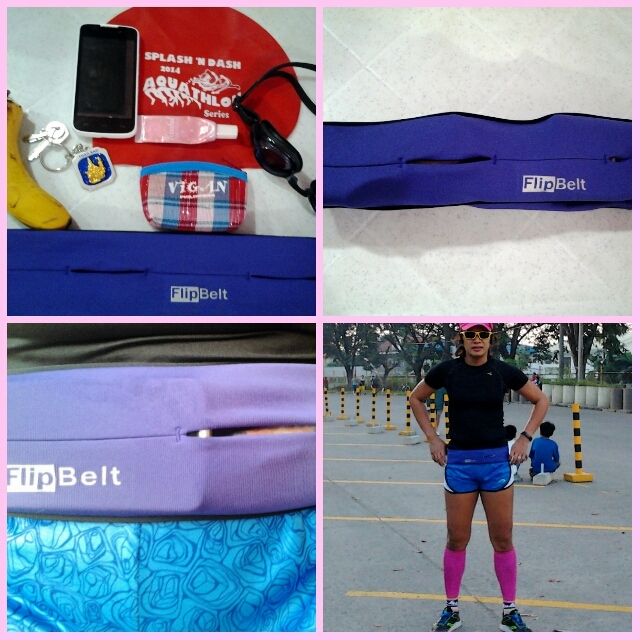 This highly elastic flipbelt can accommodate anything with a diameter or width of 2.5 inches as per my personal test. The maximum length will be half the circumference of your waist if it is of sturdy built material you are putting in, but if not, the length of your entire waist circumference! In fact, I made some experiment myself just to test the maximum size of things it can carry and let me tell you this belt is like the belly of a python. It could stretch and fit in things you would not believe could fit by the looks of it! To give you a clearer picture, the 2.5” width of the belt can accommodate my 4.5”screensize android phone. A rounded object with a diameter of 2.5” is the size of the small hydration bottle given during one of Runrio races as shown below. A friend even asked me over at Facebook if it could accommodate a shirt for changing after the run. My initial answer was that I doubt if it could. Now when I did the experiment, it did and more! I can also fit a small face towel plus the rest of my essentials. 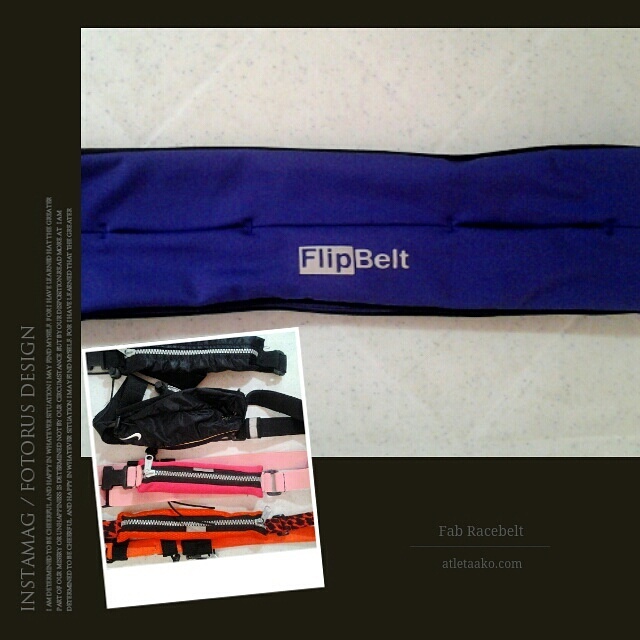 The gartered construction of flipbelt makes the items placed in it not to move about and fall. So if you have qualms that small stuffs will find their way up and out the slits, don’t be. They are perfectly safe inside even during the most vigorous of exercises that we do. In fact, just an added safety measure, there is a key strap attached inside. This construction likewise limits the juggling of all these stuffs including the metallic ones with a tendency to make these irritating clicking noises. I even deliberately threw in several coins together with the keys just to test this in one of my runs. They stayed put and made not a sound while I was running. The belt snuggly fits low waist style so make sure that you get your waist measurement correct as this determines the size of the belt. My 30-32 waistline is perfect for a medium size. An area of concern might arise if your hips are unnaturally bigger than your waist. In this case, I advise you to go a size bigger. 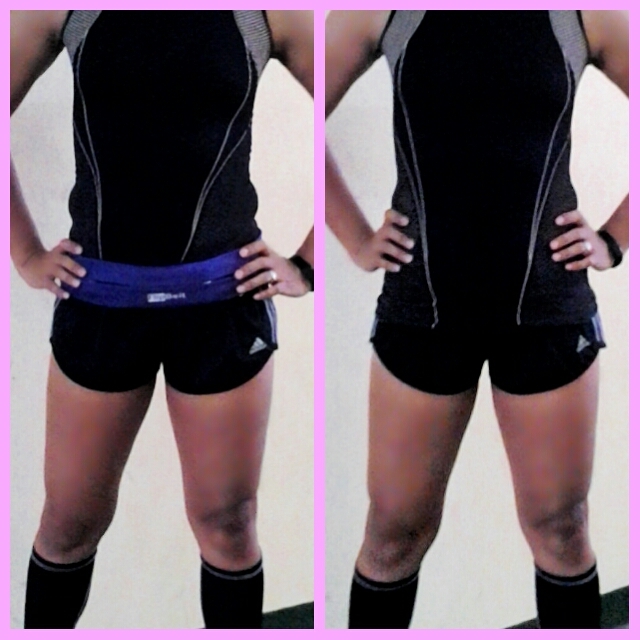 This will ensure that the belt will sit snuggly on or slightly above your hipbone and not slip up your waist. I found that the belt holds my shirt down and not slip up and down while I was running. However, you can opt to place it hidden inside your shirt if you are going for that minimalistic look and its flatted out construction even with things placed inside can project it splendidly. One problem we usually encounter with elastic materials is that they become de-elasticized over time. By physical inspection as to the materials used, I can vouch that this belt will see you through several mileages, running years and unforgettable experiences together. It is made of a thick, elastic fabric that can withstand even sharp and pointed objects; the kind that does not easily fray nor fade with the wear and tear of repeated use. The stiches are doubly if not triply reinforced at several stress and pressure points like the slits and the seams. The edges across the circumference of the belt have a sturdy piping over the already solid stitches to fortify these parts. So far I had two long runs that lasted two hours each wearing this belt packed full – including a piece of banana in one and a Cloud 9 chocolate bar in another aside from the running essentials previously enumerated. There was less to no pronounced shaking of the contents as to be conscious of from the start of the run. This is usually the part when we feel, hear, and get conscious of anything unnatural or distracting. I felt and heard none. What I felt was the reassuring tightness, neither too tight nor a bit loose but just right, that everything was kept in place including the several coins in my plastic pouch. There were instances when the belt slid up as is the usual case with elastic bands riding atop the hipbone. However, this did not bother me at all, as a few tugs here and there were enough to keep everything in place for several k’s more. The only problem I got with this as well as the rest of the hip hugging kinds was that they tend to emphasize my belly bulges on a fitted shirt. But this is my problem, not the belt’s. Ha-ha…. 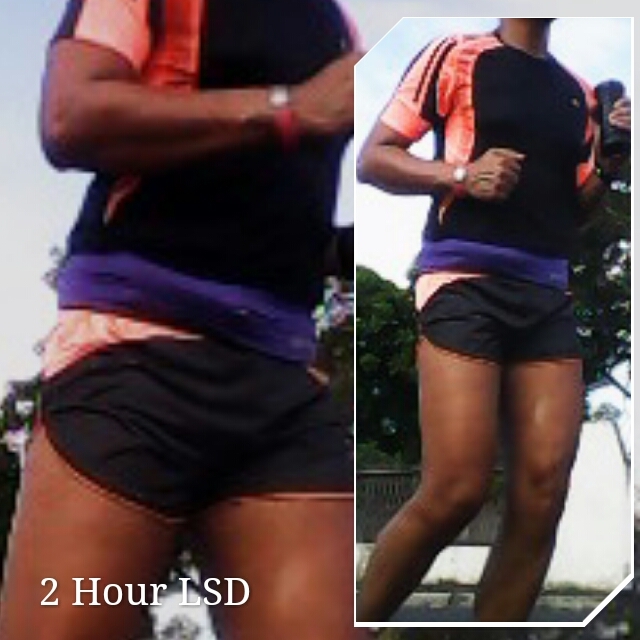 It was during one three-hour morning lsd run when I felt like not wearing a running belt when I lost the money I had for hydration. I slipped the plastic pouch it was contained in under my shorts elastic band. I had already finished my two hours running and about to head home for the last 10K. Under the heat of the almost midday sun, I usually buy a cola by the sidewalk stalls. As I was about to pay for this much needed energizing refreshment, I found out that I did have any. I searched surreptitiously the inside of my undies hoping it might have fallen there, but there was none. With dehydration creeping and my energy waning, I trudged my way home feeling remorse at not wearing a race belt just because I hated the looks of it. There is a Filipino saying that goes, “Tiis ganda!” This roughly translates to sacrificing something in order to be beautiful. This is not the case with this belt though that efficiently combined beauty and functionality. Please visit the website: www.atletaako.com where this and many more fabulous running gears, wears and items can be availed at affordable prices. 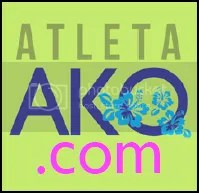 Or get information updates on their latest discount sales and contests through their Facebook page. Thank you Alyna aka DivaRunner! Thanks Mader for very informative post! It is always a pleasure of mine to share something that I think can be of great help to runners or multisport enthusiasts Cecil.